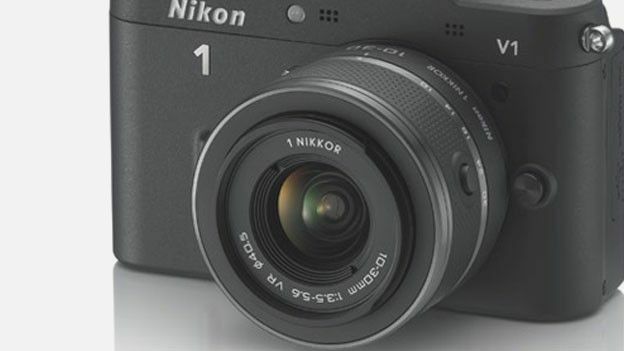 Nikon's inaugural compact system flagship camera in the Nikon V1 has the solidity and feature set to take on the likes of Sony's NEX-7 and Olympus' E-P3, but comes at a cost equivalent to a semi professional DSLR body. Nikon is a late entrant to the rapidly swelling Compact System Camera or 'CSC' market – that is, compact cameras on which there is the digital SLR-like ability to swap lenses. Olympus, Panasonic, Sony, Samsung and Pentax have all got there first. But, as one of the world's top two photographic brands, whatever Nikon came up with to compete was always going to be big news. The Nikon V1, which we're examining here, is the flagship model in a new camera system Nikon has christened '1', and which also includes the simultaneously launched but cheaper J1 model. While the latter is more obviously aimed at consumers, the pricier almost utilitarian looking V1 is hoping to also ensnare the photo enthusiast into the bargain. It's available in matt black or high gloss white body colours. The closest competitor is Sony's equally new NEX-7, which like the V1 is one of the only CSCs to feature a built-in electronic viewfinder (EVF) in addition to the standard backplate LCD. Nikon is currently claiming the V1 as the world's smallest interchangeable lens camera to feature an EVF, which here offers a very high 1440k-dot resolution, if it's also physically rather small, plus useful 100% field of view. However, small dimensions also mean that, unlike competing DSLRs and Samsung NX and Sony NEX cameras – which share an APS-C format sensor larger than your typical compact's chip at 23.5x15.6mm – Nikon's V1 features a small-ish image sensor too. At 13.2mmx8.8mm and offering a relatively modest 10.1 effective megapixels (when 16MP is now standard issue) its maker has named this new format 'CX'. Since the theory is that the larger the sensor the better the picture quality, let's take a look at how Nikon justifies the V1's whopping price tag, a suggested £879.99 if going for the kit that includes the compact 10mm, bright f/2.8 aperture lens we had on trial, fetchingly colour co-ordinated to match the white finish of our review sample. The V1 feels surprisingly rugged in the palm thanks to magnesium alloy front and back panelling, the material used in the construction of semi pro DSLRs. In this respect it is probably closest to the Olympus E-P3 Pen for built-to-last construction, and feels very much like a 'toughened' model. That said the glossy white finish of our review sample – which increases public visibility and makes the camera less useful for surreptitious snapping – did make it feel slippery to the touch. To provide purchase for the fingers there's only a small and narrow raised bump at the front of the V1, while the thumb rests on a rubberised pad at the back – but will more likely slip onto the adjacent zoom lever that is deployed for enlarging images in playback. Like Olympus and Panasonic CSC rivals (and unlike the cheaper J1) the V1 also comes with a multi accessory port – located to the left of the EVF if viewing the camera from the back – which allows for its set up to be expanded. The likes of an external microphone and GPS unit can be added. It's worth mentioning here that unlike the J1 the V1 doesn't incorporate a flash either, so that will probably be your first additional purchase. Otherwise operational controls are pretty straightforward: the shutter release is the most prominent of the top plate buttons, flanked by separate on/off and video record. At the back the shooting mode dial has just four settings: movie, still image, Smart Photo Selector (which shoots a quick sequence of images and saves only what the camera decrees to be the best five) and Motion Snapshot. The latter neatly shoots a brief movie clip and still image at the same time, so you have a moving record of the setting and surroundings of your snapshot. The other buttons at the back of the V1 are the familiar playback, display, menu and delete, with a multi-directional command pad and scroll wheel for selecting and changing functions in tandem with on-screen options. The V1 offers a now standard issue 3-inches in 4:3 aspect ratio – the default proportions of a digital image – but matches the best in its class with a sharply realistic resolution of 920k pixels; that's double most compact system camera rivals. Though it's LCD rather than the typically more life-like, high contrast OLED screens of the Olympus E-P3 and Samsung NX200, visibility is impressively clear and there's no impression of it being second best at all. Though the menu screen layout looks surprisingly basic in its design for an enthusiast model, we didn't have to hunt around too much to find what we wanted, with options decreasing or increasing depending on which shooting mode has been selected. However, a one-touch Quick Menu option, as found on Panasonic Lumix rivals, whereby key settings such as picture quality and ISO light sensitivity are grouped together in a toolbar for viewing at a glance, would have been a helpful shortcut. As noted, on the V1 we also get an ultra high resolution EVF that very cleverly activates when the user brings their eye up to it. So even if external lighting conditions cause visibility problems on the larger screen – though we didn't find this to be the case, even in bright autumnal sun – there is a fall back. Some may actually prefer the 'feel' of using the EVF if they are used to similar on bridge camera or an optical viewfinder on a DSLR. Pretty much a point and shoot camera all the way, Nikon's V1 is very unusual in that it features not one but two auto focus systems, with the inherent ability to chop 'n' change between a 73-point phase detection AF system if an object is moving or shiny surfaced, or a 135-point contrast detect AF system if stationery or badly lit. Unsurprisingly, with most consumer DSLRs offering 'mere' 9-point AF systems, Nikon is able to lay claim to the world's highest number of AF points with the V1. Also upping the technological ante is the V1's incorporation of Nikon's newest image processor, the Expeed 3, which claims to gobble data at speeds of up to 600 megapixels per second. This has enabled functions like previously flagged up Smart Photo Selector (SPS), which fires a burst of 20 shots before the shutter button is fully pressed and saves the best five, plus the ability to fire off stills at speeds of up to 60 frames per second (fps) if using a fixed AF point and, again unusually, at full resolution too. In combination it's pretty clear that if lighting is sufficient and there's a shot you want to get you will. And in practice it's an education in just how much can change (in terms of framing) in that fraction of a second. Otherwise in general terms the V1 responds as fluidly and instantly as we'd hope to each button press or swivel of the scroll wheel, though if you are using the SPS feature you don't get the satisfying sound of the shutter firing and have a brief, marginally longer wait while those five selected images are committed to memory, a pixelated 'swirl' appearing on screen while it is doing so. The Nikon V1 comes supplied with a chunky EN-EL15 7.0v battery that slides into its base next to a slot for optional SD, SDHC or SDXC card, depending on which capacity you're aiming for. Its maker claims the battery life is good for a very respectable 400 shots at best or two hours of maximum quality HD footage, which again leaves little room to grumble. The fixed 10mm (27mm equivalent in 35mm terms) f/2.8 lens bundled in the kit with our V1 was a little limited in terms of its use when compared to an all encompassing standard zoom – if you want to alter framing you simply walk forward or back – but does keep overall camera and lens dimensions as compact as can be. It can work well for portraits and still life in providing some attention drawing shallow depth of field effects (subject sharp, background softened). If you're not bothered about having as slim a combined profile as possible, going for the 10-30mm zoom kit option may be a better bet however, and this option is actually cheaper at a suggested £829.99 with the body if looking for the least expensive (but still pricey!) way to get started. For videographers the V1 also offers Full HD 1920x1080 pixels video recording at frame rates of 30 fps or 60fps in MPEG4 format, or up to 400fps if you are looking to generate slow motion footage. Using our 10mm fixed lens and with built stereo microphones mounted at the front, plus speaker on the top plate, footage looks and sounds great. As we find with Nikon Coolpix snapshots, which the V1 is a creative and technological step up from, colours can be a little muted straight out of the camera even if shooting JPEG rather than Raw. Thankfully then custom picture control includes a vivid option, just like regular Coolpix models. In terms of low light performance, the combination of sensor and f/2.8 lens delivered some fine grain at ISO1600 setting – therefore stick with ISO800 if you want the cleanest looking shots. However we'd argue that ISO3200 is still usable if pushed, even though detail is suffering and colours slightly off. The expanded ISO6400 equivalent (Hi1 setting) we found best avoided however. With rock-solid 1980's Tonka toy-like construction, love-it-or-hate it blocky design and some innovative technology under the bonnet that is more concerned with making sure you get the shot than cramming the sensor with unnecessary pixels, the Nikon V1's biggest Achilles heel is its price tag. It is almost as difficult to swallow – if you haven't actually handled one first – as the premium charged for Leica cameras such as the X1. To be fair, however, that is still cheaper than the £1100 currently being asked for a body only albeit twice the resolution Sony NEX-7 if you really do need that built-in viewfinder. Plus, when the Nikon is held in the palm, its reinforced magnesium alloy shell does at least provide an indication of where some of your money is going. Existing Nikon converts looking for a more portable back up for their digital SLR may still prefer the closer more familiar feel of a Nikon P7000 or P7100 to the flashier V1, which is more reinforced sports car than tank-like work horse. Ultimately it can be assumed that this is down to the fact that Nikon won't want it to eat into sales of their DSLRs or high-end bridge cameras. But those of us upgrading from a humble compact in wanting a better and faster performance yet not the actual bulk of a DSLR, and who have up until now been considering an Olympus E-P3 or new high end G-series Panasonic, have discovered another head turning contender for our cash.